High Quality Content by WIKIPEDIA articles! 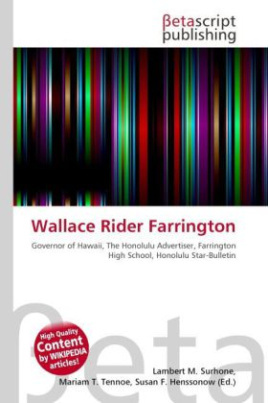 Wallace Rider Farrington (May 3, 1871 October 6, 1933) was the sixth Territorial Governor of Hawai i, serving from 1921 to 1929. Prior to his term, he was editor of the The Honolulu Advertiser and Honolulu Star-Bulletin newspapers.Farrington was born in Orono, Penobscot County, Maine on May 3, 1871. An avid traveler, he found himself in Honolulu, Hawai i and was persuaded to stay to become the editor of the Honolulu Advertiser. He left the newspaper after three years of service to become the editor of the Honolulu Star-Bulletin. Interested in local politics, he was elected Mayor of Honolulu.